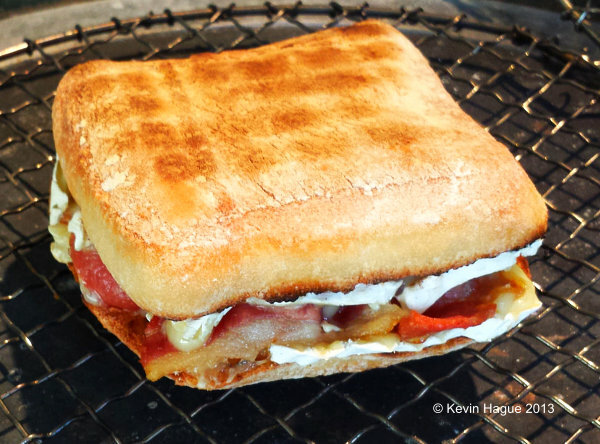 ThisCrispy Bacon and Camembert Ciabatta is an amazing, and delectable roll to serve at breakfast. Creamy, oozing cheese, and crispy bacon, with hint of tangy chilli in the background all served up in a toasted ciabatta roll. Sheer heaven! This is another recipe from our guest chef, Kevin Hague. Serves 1, but just increase the quantities for more servings. Cook the rashers of bacon until they are crispy. Cut the roll in half and toast the inside. Thickly spread both the toasted sides with Camembert cheese. Place the bacon on one side, and add the Padrón Chillies if you are using them. Now toast the roll on both the top and bottom.